Kate and Julie set off in pursuit of the so-called speedsters, Ross, Leigh, Jan, Jim, and Alan. 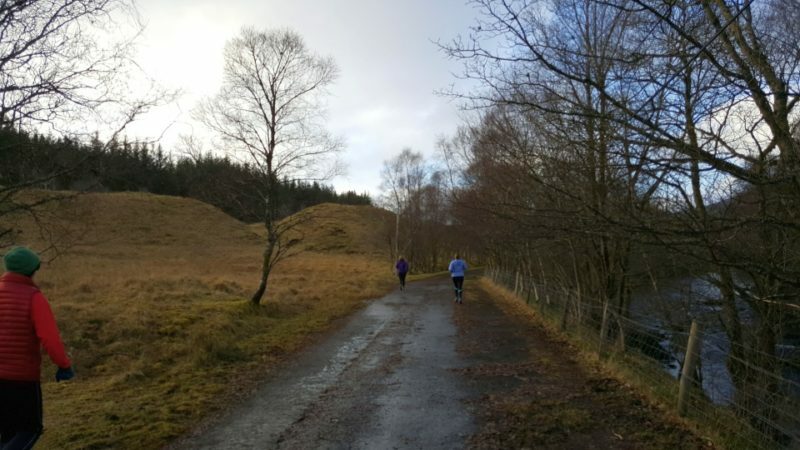 Jim lead Ross, Leigh, Jan, and Alan on a super 9k run incorporating part of the West Highland Way and forest tracks in Glen Cononish; Kate, Julie, Carol, and Andrea ran part of the route; Bill biked part of the route; and Alasdair and Ellis spent the time sorting Ellis's bike. Everyone retreated to Artisan Café, courtesy of Diane, to reflab on superp soup, toasties, sandwiches, cake, coffee and strange drinks featuring marsh mallows. A significant number want to do this every week! The slower running ladies decided to head out on the two smaller loops. When we crossed the bridge Julie and Kate headed left around the smaller of the two loops first so, just to be different, Andrea and I went right following the path along the river, through the underpass and onto the road on the other side. This climbed slightly and Andrea found it more efficient to walk as, still running, I huffed and puffed beside her. A right turn at the farm had us heading along level ground towards the ruins of St Fillan’s Priory with the fabulous snow cover peaks of Ben More and Stob Binnein behind. A right turn just after the Priory and we were heading back down towards the river. All this initial part of our run was along the West Highland Way passing through land managed by SRUC (Scotland’s Rural College) with lots of interpretive panels for those that had time to read them! A path alongside the river eventually took us up a gentle incline and back to the farm and from here we retraced our steps back to the bridge. Time for loop 2. We did walk quite a lot of this but decided to jog along the footpath by the river as we headed for home. It was then that we found the sign telling us that we had just run around the site of the Battle of Dalrigh. At this point the hares on the 10 km run caught us up but had to wait to pass until the tortoises reached a wider bit of track. Back over the bridge and with the smell of soup and toasties in our nostrils we made a determined effort to run all of the last bit back to the café with the added incentive of trying to complete it in under an hour. With a final “sprint finish” this was achieved and the 5km route that we set out on turned out to be 6.6km! With some trepidation this little pseudo-hare started out with the rest running to Tyndrum along the West Highland Way, looping uphill through the forest and back along the track to the café. The run was very much enhanced by the pleasure of picking my way over the rocks, through the heather, around the ice and over the snow, tackling the climbs to be greeted by stunning views over the straths followed by rolling downhills and open running along the tracks back to the lure of the cosiness of the café and a steaming bowl of lentil soup…or thai sweet potato soup…or chicken broth. The whole experience was rounded off nicely by the most enormous piece of coffee and walnut cake - “far too big,” murmered Alan but I did notice that he didn’t seem to have too much trouble demolishing it! A big thank you to Jim and Diane for giving us an excellent base from which to de-flab and then for providing wonderful grub to undo all the de-flabbing! See you all for our 5th event at Glencruitten woods on Sunday, 28th January 2018. 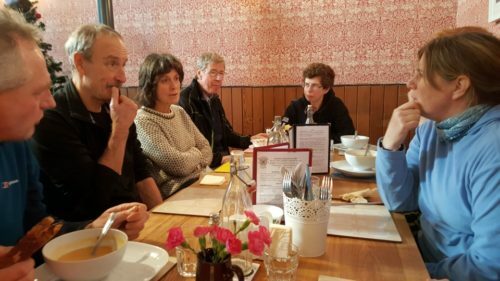 Chin scratching as Ecko reflabbers debate the merits of Artisan's excellent soups.